It has surely happen, at least once in your life, to see the Bay of Naples, even if only in postcards, with Vesuvius in the background to master. Between the visible lava flow from last eruption in 1944 and Mount Somma that gave birth to the volcano, about 16 km as the crow flies from the crater, there is a village that has more or less 9,000 inhabitants and takes the name from its patron saint: San Sebastiano al Vesuvio. Located at a short distance from the city, Gaetano Filangieri’s district is known to the Neapolitans and food experts for its little tomatoes, commonly called Piennolo, for the Catalanesca grapes and for its delicious bread. And today, I want just to talk about the bread from San Sebastiano. Omnipresent on the Neapolitans tables, especially during the Sunday lunches, stands out from the common white bread, produced not only in Naples and surroundings but also in the south of Italy, for the compliance of a centuries-old tradition which requires the use of medium strength wheat flour (historically mixed with wheat flour), the use of low calcium water (water has always been kept from the Serino aqueduct constructed during the Augustus period of the Roman Empire), the use of mother yeast, called in jargon pasta di criscito or simply criscito, baking in handmade ovens with the high chamber and powered until a decade ago with chestnut bundles, a practice that, for a matter of hygiene and protecting the cooking surface from the frequent cleaning with very wet brooms, has been supplanted by the use of hazelnut bark powered burners. Not forgetting its long rising time that, as for all high quality baked goods, takes about 15 hours, occurs at room temperature, which is checked by the master baker experience, or with the help of a refrigerating room during the warmer months of the year. With the exception of kneading that, given the large volume , from 5 to 10 tons per day for the family-run shops, is made with the mixer, it is a totally handicraft process as for sizing and shaping the palatoni, from 1 kg to 1.5 kg, and 500 gr palatelle. A process codified by strict rules of production that, however, have not been recognized yet because of too much bureaucracy. 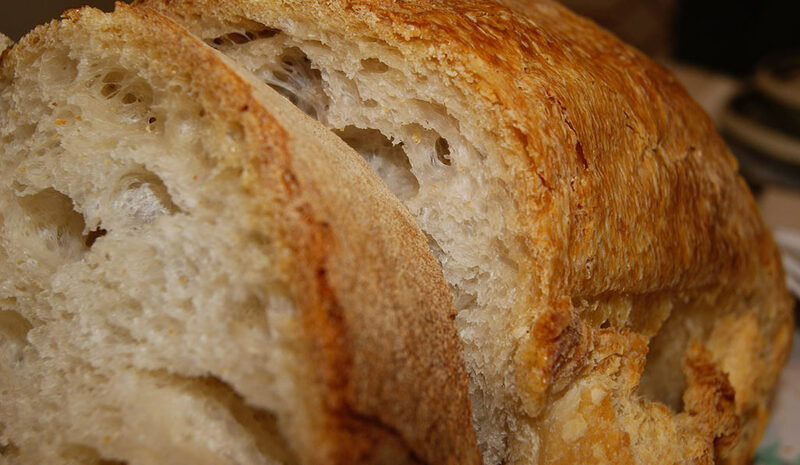 Wrong and moreover offensive to the local bakers is the word pane cafone (crusty bread), the white bread with a larger shape, usually made with the compressed brewer’s yeast and with shorter rising times, before being cooked on the refractory surface of electric ovens. From San Sebastiano to Pollena Trocchia through Massa di Somma and Cercola, the love and passion for this product and the territory have played a key role in preserving this kind of bread, which is still produced as a hundred of years ago it was made. From thick, crispy and savory crust to the soft and fragrant guts, with the unique alveolus it looks like the Swiss cheese and fresh-baked, still warm, it releases an aroma that gives intense emotions. My hope is that in 50 years this tradition is still alive. Long live San Sebastian and its bread!